Kevin Sumner stories at Techdirt. stories filed under: "kevin sumner"
Putting cops in schools often turns routine disciplinary issues into police matters. That's a problem. Cops -- given the friendly-spin title of "school resource officers" -- have a limited tool set for handling discipline. It involves shows of authority, deployments of force, and, in this case, adult handcuffs clamped onto an 8-year-old's upper arms. Tiny wrists can't be secured by adult cuffs, so up the arm they go until they more resemble an instrument of torture than a restraint device. This cuffing was performed by Deputy Kevin Sumner of the Kenton County (KY) Sheriff's Department. The Sheriff's Department claimed the deputy followed policy, but could not produce any policy relevant to the handcuffing of small children. Experts on force/restraint deployment said this cuffing didn't follow any protocol they were aware of. Sheriff Korzenborn insisted (without any evidence) this technique was proper and testified he did not order retraining of officers in child-restraint techniques following the incident. Last year, a federal court declared this handcuffing to be excessive force. It pointed out the alleged "crime" did not justify the force deployed and, even if it had, the force used was far in excess of what was needed. The second factor, whether the children posed an immediate threat to themselves or others, weighs in S.R.’s favor. At the time he was handcuffed, S.R. had largely calmed down, Sumner had escorted him to the restroom without incident, and they had returned to the office. While Sumner testified that S.R. swung his elbow towards Sumner, such can hardly be considered a serious physical threat from an unarmed, 54-pound eight-year-old child. A little over a year later, the two elementary school students will be receiving a payout from Kenton County taxpayers. Despite the ruling and the settlement agreement, Sheriff Chuck Korzenborn remains unrepentant. He views this settlement as a cowardly capitulation by the company fronting the money for his deputy's misconduct. Handcuffing children and causing this sort of reaction is just good school policing, according to the sheriff. This is what the sheriff considers to be a worthwhile punishment for an 8-year-old student who tried to punch his deputy in the arm: a painful, unconstitutional handcuffing followed by a few years of nightmares and family upheaval. It will happen again because Korzenborn believes he -- not the law, not policies, and not the federal court -- is right. He's a law unto himself, and that makes things dangerous for students in the county's schools. And he's a walking advertisement for personal indemnification. You wouldn't think it would take a federal court decision to make this clear, but here we are. A school resource officer in Kentucky who handcuffed young children acted unreasonably and violated the children's constitutional rights, a federal judge ruled this week. The ruling [PDF] restates common sense, albeit in 33 pages of legalese. It is excessive force to restrain preteens who weigh less than 60 lbs. with handcuffs meant to keep full-grown adults from moving their arms. The procedural history notes school personnel are forbidden from using mechanical restraints on students by state law. This law, however, does not forbid law enforcement officers from using handcuffs on students. In both cases, the students cuffed by a sheriff's deputy had been combative. School personnel turned both students over to the SRO once it became obvious they would not be able to calm the students down. The combativeness didn't stop once the deputy entered the picture. These would appear to be arguments in the deputy's favor but only if other factors weren't considered -- like the students' ages and sizes. Both children also suffered from behavioral disorders. Sumner handcuffed S.R. behind his back, placing the cuffs on S.R.’s biceps above the elbows. The video shows that S.R.’s arms are pulled tightly behind his back with what appears to be only approximately three or four inches between his elbows. Sumner testified that he checked the handcuffs for tightness and that, since the chain connecting the handcuffs was nearly as long as the width of S.R.’s body, he had no reason to believe it would cause him pain. The video clearly demonstrates, however, that the chain is not nearly as wide as S.R.’s body, and that his arms are extremely taut. Sumner pulled L.G. off of Craig and tried to hold her physically for a few minutes, but she continued the same behavior. Sumner told L.G. that if she did not stop, he would handcuff her. L.G. continued to kick and hit, and Sumner placed her in handcuffs, above her elbows behind her back. Assistant Superintendent Wilkerson contacted L.G.’s mother, who came to school to get her. Her mother testified that when she arrived, L.G. was on her knees and Sumner was holding her arms up behind her above her head. Sumner then removed the handcuffs. Sumner tried to argue the handcuffing was permitted because state law exempted law enforcement officers from the restriction on restraint methods. The court says that's all well and good, but it doesn't change the outcome. No matter which "hat" -- school personnel or law enforcement officer -- Sumner was wearing, the force used was excessive. This factor weighs less in favor of L.G., who was engaging in more physical abuse towards her teachers and Sumner. Nonetheless, the age and stature of these children is highly relevant to this analysis. Even if the cuffing were deemed appropriate, the method deployed by Sumner was not. Finally, the method of handcuffing that Sumner employed leads this Court to conclude that his actions were unreasonable and constituted excessive force as a matter of law. The video of S.R. shows that his arms were pulled tightly behind him, with only inches between his elbows. While Sumner testified that the chain between the cuffs was as wide as S.R.’s torso, the video belies that assertion. Where a witness’s version of the facts “cannot be countenanced based upon what the video shows,” the Court must adopt the video as fact. Upon being cuffed in this manner, S.R. cried out, “Ow, that hurts.” It was thus immediately apparent that this method — which, it is undisputed, was the same method by which L.G. was cuffed — was causing pain. S.R. was left in this position to cry and squirm for fifteen minutes. And there was no one willing to back up Sumner's claims the cuffing method was common or inexcessive -- not even those testifying on behalf of the deputy. Plaintiff’s handcuffing expert, Robert Rail, testified that he does not know of any police instructor in the United States who would allow the elbow cuffing of children such as was used on S.R. and L.G., nor does he know of any program that teaches that method. (Rail Depo. 109-10). Even defendants’ handcuffing expert, William A. Payne — who has been conducting handcuffing training for law enforcement for over 20 years — testified that he has never trained law enforcement to use handcuffs above the elbow. (Payne Depo. 37, 121). He further testified that he was not aware of any law enforcement agency that trains their officers to use such a technique. The court finds the cuffing method -- not the cuffing itself -- excessive. Without any prior cases on point, Deputy Sumner is granted qualified immunity because he could not have reasonably known his handcuffing methods were excessive. This is disappointing, but the court has one surprise left. The county that employs Sumner can be held civilly liable for Sumner's actions. Kenneth Kippenbrock was the SRO Coordinator for the Kenton County Sheriff’s Office at the time of these events. He testified that Sumner’s handcuffing of S.R. and L.G. was consistent with the policy of the sheriff’s department. He also testified that since the SRO program was initiated, more than ten children have been handcuffed by SROs in schools, and it is possible that the number is more than twenty-five. Kenton County Sheriff Korzenborn also testified that Sumner acted in accordance with all applicable Kenton County policies in handcuffing S.R. and L.G. He has never asked Sumner whether Sumner has ever handcuffed other elementary children in the district, and he is not interested in knowing how often his deputies handcuff school children. 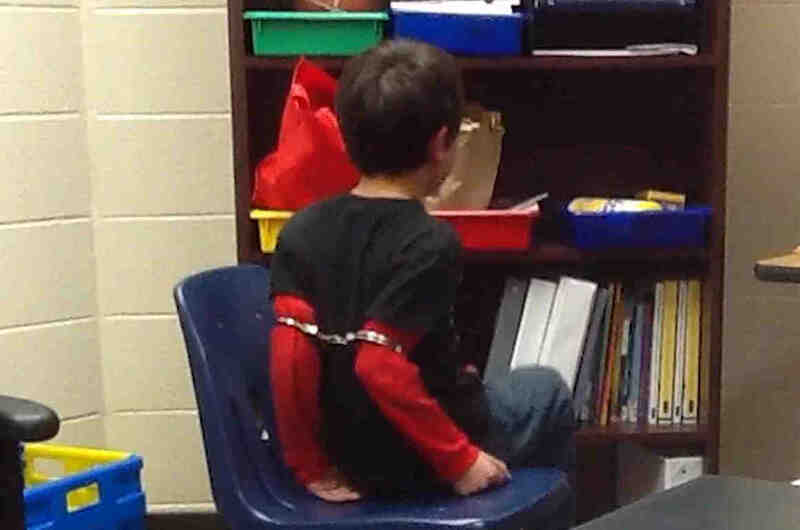 Handcuffing children above their elbows behind their back is acceptable practice by his deputies. Korzenborn further testified that he was not familiar with the Kentucky Administrative Regulations regarding the use of mechanical restraints in schools. Korzenborn has not implemented any changes in the training of his SROs since these incidents. Given this undisputed testimony, Kenton County is liable as a matter of law for Sumner’s unlawful handcuffing of S.R. and L.J. School resource officers won't be able to handcuff students the same way in the future and expect to walk away from resulting civil lawsuits. The unanswered question -- is it ever appropriate to handcuff pre-teens on a school campus -- remains open. But the message sent here is pretty straightforward: there's almost zero chance the court will find it acceptable to use adult handcuffs on children, because the only way to keep them on tiny bodies is to deploy them in a fashion that is excessive in nature.